Tony Radcliff promoted to VP of Group Technology for Uponor Corp.
Uponor wins patent infringement suit against Heatlink Group Inc. and PexCor Manufacturing Inc.
PEX manufacturer receives industry-acclaimed Partners of Choice award from largest privately held builder in the country. 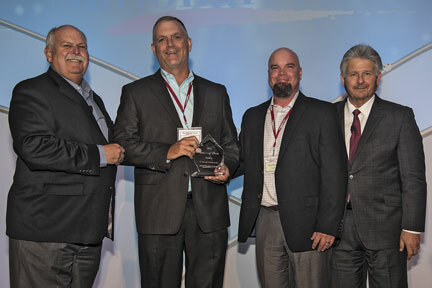 Apple Valley, Minn., Aug. 1, 2016 — For the third year in a row, Uponor North America (Uponor) is a Partners of Choice award recipient from Houston-based David Weekley Homes, the nation’s largest privately held homebuilder and the first builder in the United States to be awarded the Triple Crown of American Home Building. This year, Uponor received an A ranking for service through participating in the builder’s world-class supplier feedback platform. The process is rigorous; approximately 1,000 team members from all over the organization participate. Then, through a series of conference calls, individual discussions, sessions and data analysis, both parties work together to seek excellence. Of the 200 companies evaluated in the survey, only 25 were awarded with an A ranking in service, quality or both. Uponor, who received an A,A ranking in both quality and service along with an A ranking in quality in 2014 and 2015, respectively, is one of only 10 companies to be awarded three years in a row. "To be a world-class homebuilder, you need to source from the top suppliers in the industry," says Bill Justus, vice president of Supply Chain Services for David Weekley Homes and author of the innovative program. "Our program is a practical way of measuring world-class performance. With ambitious growth plans in front of us, we will rely heavily on our award winners to help us deliver a superior experience to our homebuyers. With approximately 1,000 rating opportunities, our team members have said Uponor is world-class in delivering service to our company." Justus created the supplier-assessment platform in 2004 to improve the relationship and interaction between the builder and its suppliers. Since then, the homebuilding giant has continued to raise the bar in its expectations from suppliers to ensure the quality of their homes remain at peak levels. "The benefits of the survey feedback go beyond our relationship with David Weekley Homes," says Carl Hines, national builder sales manager at Uponor. "The feedback we receive helps us advance our business as well, allowing us to continually improve our processes to ensure all partners in our value chain are confident doing business with us." Uponor, Inc. is an award-winning provider of plumbing, fire safety, radiant heating/cooling, hydronic piping and pre-insulated piping systems for residential and commercial applications. Uponor, Inc. has received recognition for best-in-class manufacturing, sustainability, energy efficiency, safety, business growth, economic development, workplace giving and being a top workplace. The company employs about 500 people at its North American headquarters in Apple Valley, Minn. For more information, visit www.uponor-usa.com. David Weekley Homes, the nation's largest privately-held home builder, is celebrating its 40th anniversary in 2016. Headquartered in Houston, the company operates in 24 cities and 13 states across the United States. David Weekley Homes was the first builder in the United States to be awarded the Triple Crown of American Home Building, an honor which includes "America’s Best Builder," "National Housing Quality Award" and "National Builder of the Year." David Weekley Homes has also appeared 10 times on FORTUNE magazine’s "100 Best Companies to Work For®" list. Since 1976, the company has closed more than 80,000 homes. For more information, visit www.davidweekleyhomes.com. David Weekley (left) and Bill Justus (right), vice president of Supply Chain Services at David Weekley Homes, present the Partners of Choice Award to Carl Hines, national builder sales manager, and Tom Stewart, regional sales director, at Uponor. 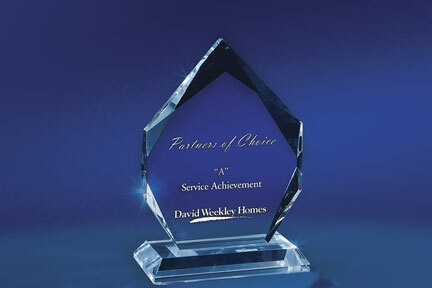 The David Weekley Homes Partners of Choice award recognizes suppliers that exhibit world-class quality and service. *To download a hi-res image file, click on the link above and a zip archive automatically downloads to your computer. Due to how various browers handle downloads, you may have to expand the zip archive manually.